Take 1 capsule daily or as recommended by a healthcare practitioner. Take with Vitamin C for enhanced absorption. The Mayuzumi family of Japan is the world's foremost experts on producing the highest quality red reishi mushroom. In 1976, the family patented the most superior strain and perfected its cultivation and concentration methods to the exacting standards of the Japan Reishi Association (JRA). The JRA hologram on each box of Mikei ensures quality, safety, and efficacy. 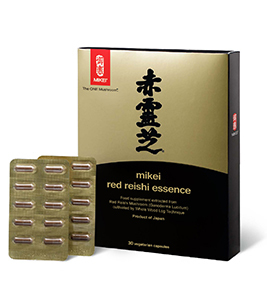 The JRA hologram on every box of Mikei Red Reishi ensures quality, safety, and efficacy. > Next Section: Why Mikei?